This article is meant to assist you in working with views found in the extendedReach Side Menu. 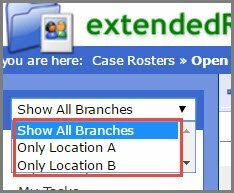 extendedReach is organized in a manner that allows you to easily access comprehensive agency-wide data through the use of Side Menu “Views”. For more information regarding the details of Side Menu – Accessing Views, please see Related Topics at end of this article. By viewing this agency-wide data in a variety of ways, agencies are able to report on various aspects of the organization, as well as make projections for future opportunities. The following are general working terms, not specific to a particular worker. If your agency consists of multiple branches or units, you can filter views only relating to (a) particular branch(es). 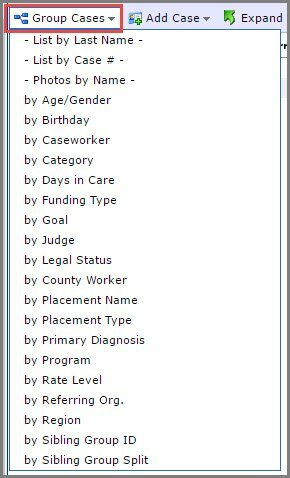 Select from the “Branches” drop-down menu, and click on the applicable branch(es). To export data from a particular view, to a Microsoft Excel spreadsheet, click on the “Excel” button at the top of a data screen. The data will download to your desktop and you will be prompted to open the file. Group data in a variety of ways. Click on the “Group” button within a section and select from the drop-down menu which type of group you want. Expand or Collapse data by clicking on the plus or negative icons one by one. To expand everything at once, click on the “Expand All” button at the top of the screen.